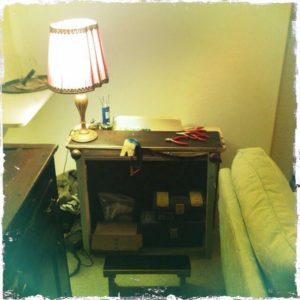 As I am quite often on the move I have now constructed this light weight work bench. I call the design “Crabby”. It really gave me lots of joy building something on a larger scale and using old scrap wood, the main worktop is made out of two seats of some sort that I found in a pile while going for a walk here in the East Sussex countryside. Many bespoke jewellery deigns and commissions will be made from this workbench from now on and when it time to pack up I can just put in the back of the car!